My wedding dress wants adventure. My dress does not want to be in a box in storage. My dress does not want to be saved. * My dress wants to dance, to wander through the snow and to meet people. My dress wants to party. These are the grand and fabulous adventures of my wedding dress, from it’s conception to what it’s up to today. I had very few day dreams about my wedding as a girl: location, food, what people would wear – I figured that the groom and I would work that out when the time came. All I knew for sure is that I would wear red. Deciding on the exact shape of my wedding dress though? That was more of a challenge. However, after I modeled for Delicious Corsets at the Philadelphia Tattoo convention, I knew that’s what I would be wearing on my wedding day. The corset I wore was so comfortable. It is supportive and its longer than most corsets, preventing the muffin tops from pooching out from under, or my ample bosom from springing out from over. 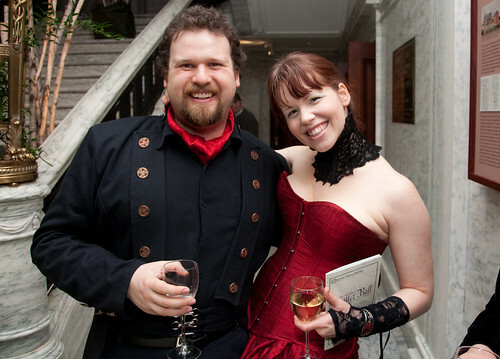 When I got engaged I went to Delicious Corsets, picked out a fabric and they made a beautiful corset from my measurements. Delicious Corsets also sold me the corset fabric, so that I could have a matching skirt. I was so fortunate to have a friend like Andrea, who is a talented seamstress, who made me the bottom half of my wedding dress as a gift. Andrea made the most amazing skirt. She fit it to me perfectly, and having a skirt made by a friend made the whole outfit so special for me. When I first put the dress on, I was thrilled. I never felt so confident in an outfit. It was exactly what I wanted it to be, and expresses my bold, sometimes dramatic, but always colorful personality. I got married in it in 2008, just four days after my birthday, the greatest gift I have ever received. This photo, which you can make larger by clicking, was taken by Jake Royal, a friend of the family. Note Jared’s perfect dip execution. After the wedding though, I didn’t pack up the dress in a box and stick it in storage. I knew that, at least, I wanted to wear that corset again. The next time I put on my wedding dress was the very next month, when I was doing a photo-project called “365 Days” where I took a self portrait every day for a year. For Day 365 I wanted to take something dramatic, so I used the skirt, along with another corset I own to put together an outfit that would have some romance in it. I got up before dawn, ran out to Forbidden Drive, and took a bunch of photos. I knew that with the greys and bright yellows, the red would pop out in the image. My dress got to go to a wedding in 2009, when I attended the wedding of Kyle Cassidy and Trillian Stars. The dress code for this wedding was fantastic – everyone wore everything – from jeans and a t-shirt to ball-gowns to traditional formal attire to bohemian. I danced with the MC, a handsome young man who later became a good friend, and one of my best models. Early in the morning of New Years in 2010, after a light snow, Kyle Cassidy called my husband and I up and asked if we would like to do a photoshoot. We said “Of course!” because we live just blocks away, and Kyle asked if I would wear my wedding dress. The photo below was the fabulous result. I have the photo above as a poster in my house. The werewolf in the mask is my husband, Jared Axelrod. That was a fun day, running around in the cold air of a new year, taking lots of fun photos with an amazing photographer. Later that year, in March, the Mutter Museum held it’s annual benefit ball, and what better to wear to the ball than a ball gown? So I strapped myself into my dress yet again and danced the night away with my friends. Also, as you can see from the photo, there was a lot of very nice wine. 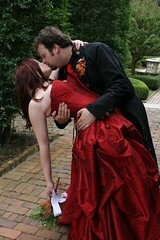 The ball was Steampunk themed, so it was great to have a dress that was so dramatic to wear. Lots of people had amazing, creative outfits that night. 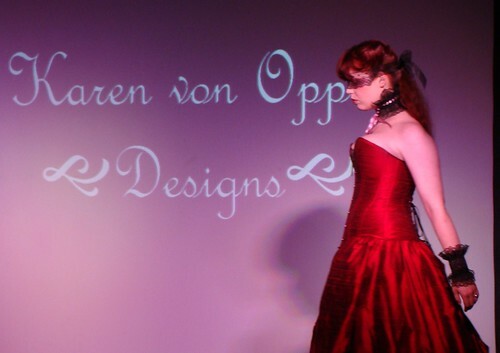 KVO designs asked me to model some accessories for a runway show they had in May, 2010. To compliment the fabulous drama of the accessories, my wedding dress made an appearance on the runway. 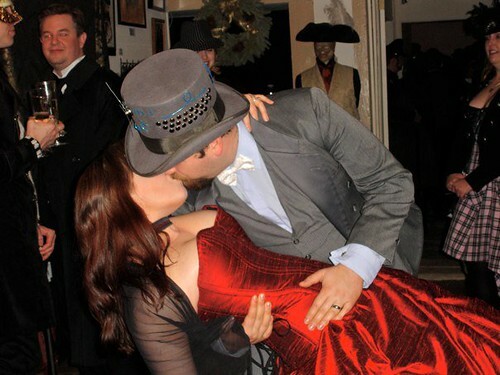 To ring in 2011, my wedding dress came out again, and I danced all night in North Carolina with friends. When the new year rolled in, my husband swept me in one of his perfect dips. My wedding dress dips with confidence! Most recently, I went to the Steampunk Worlds Fair in NJ, where I was wearing. . .you guessed it! My wedding dress. At least, the corset section. I complimented my corset with a little flouncy bottom and fun tights, and ran off to the fair. When I got there, I was asked for an interview by Mo Rocca! Mo specifically asked me about my corset. You can view the video here, where I explain how comfortable and supportive my corset is. My wedding dress has gotten around. My wedding dress has danced, been chased by a wolf and walked the runway. I’ve taken it to conventions and down the block. It’s been an outfit I’ve gotten to wear repeatedly, across state lines and ballroom floors. Might someone spill wine on it and ruin it? Could I fall into a puddle or rip the fabric. Sure! But I have gotten the joy of wearing it again and again. When I wear it, I remember the happiest day of my life, and make memories of all the happy days that have followed. Like me, it is dramatic, fun, and sometimes it gets dirty. There is always a risk to having adventures, but I don’t regret a single moment. *There is nothing wrong at all with wanting to save and preserve a wedding dress – it’s just not for me. In fact, there is nothing wrong with not having a dress or a wedding at all! Wear what you like, and do what you will. Photos in this post were taken by me, Leah, Bunny Greene, Kyle Cassidy, Justin Moore and Jake Royal. I’m so glad you’re gotten so much wear from it and I am so happy that I was part of your big day. Andrea, I get compliments on the skirt all the time! People are always asking me: “Where did you get this?” I always think about you when I put it on. I love it. I’m impressed by the beautiful city,the cute couple and the lovely photos!Best wishes for you!